Zion was one of those places I always wanted to visit, and hailing from the Pacific Northwest, it made a lot of sense to travel there in winter to beat the crowds our way down to Tucson, Arizona where we'd spend a few days in the Southwest with family before returning. I tend to travel in the off season, so much so that on my last trip overseas, it got me in trouble. I found myself on the mostly deserted island of Sardinia for a week in a VW van. Getting around and finding campsites was a challenge, and finding a place to eat dinner was even more difficult since many restaurants were closed. The trip taught me to plan my off season adventures carefully. On the plus side, off season travel means fewer tourists jammed into iconic spaces, and savings since hotels and airlines tend to drop their prices in the off-season. Still, a carefully planned itinerary is essential so you'll know what to expect upon arrival. We planned a road trip that would take us from Oregon through Nevada to Utah, where we'd make our way down to Zion National Park. The winter temperatures in Zion would be in the 50s which sounded perfect. If we were lucky we'd have temps in the 60s during the day (if we were unlucky the 40s), with temperatures dipping below freezing at night. 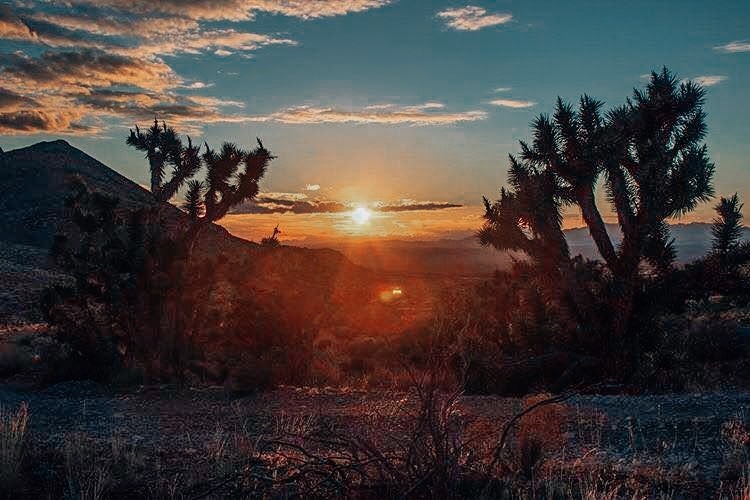 We were not strangers to desert winters, having spent a few living in Tucson, Arizona ourselves, and knowing that temperatures can drop dramatically overnight. Armed with this knowledge, we knew it wasn't the best time of year for camping (the truth is, I'm not really a camper anyway, I had something else in mind). Lucky for us, traveling in the off season means great rates at hotels and vacation rentals. We wanted to be relatively close to St. George for it's amenities and restaurants (don't miss Cliffside Restaurant at the Inn at the Cliffs). St. George offers a variety of places to stay whether looking for a hotel, vacation rental, or campsite. Glamping Hub is another great choice for finding unique vacation rentals near Zion, with 22 glamping destinations near Zion National Park. Ranging from spacious log cabins near Zion, to luxury tents and yurts, we had our pick of places to stay in Zion. Prices range from $100 - $550 depending on the size, proximity to Zion, and amenities. We had three days to explore the Park, and our itinerary shaped up to be equal parts adventure and restoration. On our first day, we'd hike Emerald Pool, Weeping Rock and along the Virgin River at the end of Zion Canyon Scenic Drive at The Temple of Sinawava. Each of these trails were considered easy but combined meant a full day of hiking. These were also all lower elevation options that promised less chances for ice and snow on the trails. High above our heads, we'd enjoy snowy vistas while pulling off layers as we worked up a sweat below. In winter, accessibility to the trails is actually a bit easier as you can travel by car, whereas in summer, over one million visitors means the roads are closed off to prevent traffic jams. There's a feeling of peace, solitude and seclusion, like the park is entirely yours in the winter months. That said, it's vital to check weather conditions leading up to your arrival, check in at the Ranger Station the day of, be cognizant of warning signs around the park, and come prepared. An "easy" trail with a layer of ice is more than meets the eye. We packed crampons (think snow tires for your hiking boots that can easily be taken on and off) and snowshoes. Suffice to say, the snowshoes were overkill, but better to come prepared. We also packed and wore plenty of thin layers that allowed us to keep warm and cool off as needed. On day two, we planned to split up - my husband hit Gooseberry Mesa on mountain bike, while I explored the hot stones at Amira Spa, the only four diamond resort in Southern Utah. Despite being a fun winter ride, it is possible to see snow on Gooseberry Mesa which is located just southwest of Zion. My husband assured me he wouldn't take any risks, and a week of warmer temperatures leading up to our visit meant the trails were clear and he had a great time. On day three, we decided to take advantage of the open roads. We took the 6.5-mile scenic drive along the Virgin River with many stops along the way. Stunning views of the canyon and famous Zion rock formations were never ending, and afforded us several short hikes and photo opps along the way. In winter, the water levels tend to be a bit higher from snow melt, and the light dusting of snow creates a surreal backdrop against the reds of the canyons. 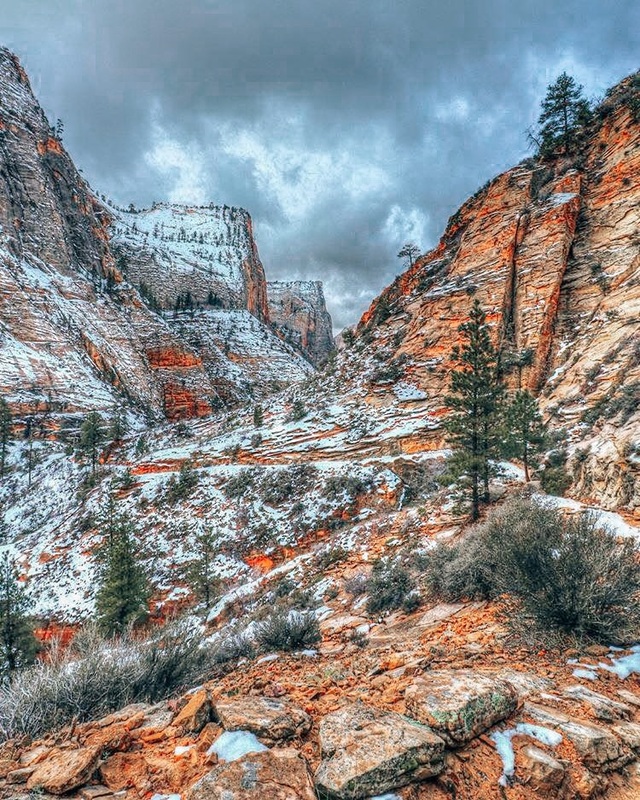 If having a National Park to yourself excites you, and if you're comfortable hiking in colder temperatures, winter glamping in Zion National Park may be for you. St. George makes the perfect base camp to explore the park in all four seasons, but there's something special about finding your way here in winter. This post was sponsored by Visit St. George, but you can trust that my opinion is my own.